Eating yogurt is a tasty way to get some health benefits. And just what are the health benefits of yogurt? Your body needs to have a healthy amount of ”good” bacteria in the digestive tract, and many yogurts are made using active, good bacteria. One of the words you’ll be hearing more of in relation to yogurt is ”probiotics.” Probiotic, which literally means for life refers to living organisms that can result in a health benefit when eaten in adequate amounts. Raw milk has multiple benefits, too. From enzymes to minerals, proteins and healthy fats, it’s a perfect food. Read more of some of the benefits of raw milk here. Through the process of fermentation, in the yogurt making process, several strains of bacteria naturally present or added later (Lactobacillus, Leuconostoc and Pediococcus, to name a few) can transform milk into an even more digestible food. You can buy your yogurt at the store, but then you have to deal with the trash, and the possibility of added, hidden aspartame. So, the best way to avoid both the trash and chemicals is to make your own homemade yogurt! 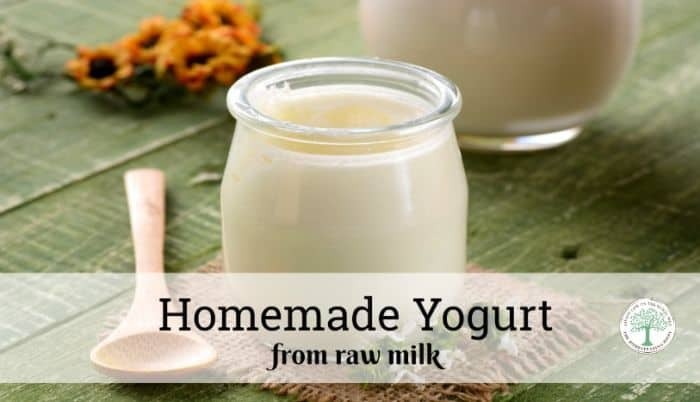 Homemade raw milk yogurt is so easy and will give you the benefits of probiotics AND the nutrients in the raw dairy! There are several ways how to make yogurt from raw milk. Each of them are easy to learn and do, and will give you the best, thick and creamy yogurt ever! Gently heat the milk to 120 degrees Fahrenheit. Using a thermometer, allow the milk to cool to 105 degrees. Set the crockpot on “low” and add 1 cup of water. When the milk has cooled to the right temp, add the starter yogurt and mix gently. Pour the milk and starter mix into the oven proof bowl and place in the crockpot. Fill the sides of the crockpot with water to the outside edges of the bowl. Put the lid of the crockpot on and leave on low for 2 hours. Without removing the yogurt, turn the crockpot off and cover with a large towel. Remove from the crockpot the next day and store in the fridge immediately before stirring. Allow to chill for 3-4 hours, then enjoy! How to make raw milk yogurt in a cooler is pretty easy, too. Boil 3 quarts of water. Pour the milk and starter mix into the mason jar and set inside the cooler. Pour the boiling water into the remaining jars and set next to the milk mixture. Shut the cooler lid, and leave undisturbed overnight or for 6-8 hours. Remove from the cooler the next day and store in the fridge immediately before stirring. Pour the milk and starter mix into the mason jar and set inside dehydrator. Turn dehydrator on low, or 110 degrees. Leave undisturbed overnight or for 6-8 hours. Remove from the dehydrator and store in the fridge immediately before stirring. What are some of your favorite ways to make homemade yogurt? What are some of your favorite ways to eat homemade yogurt? 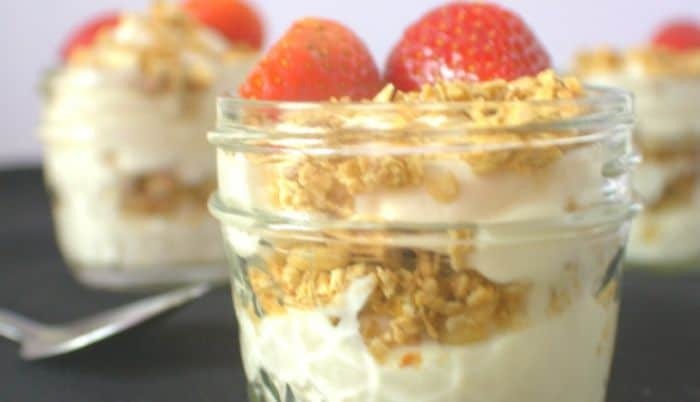 Do you like to make granola parfaits like this-(get the recipe here) or just eat it plain? Do you add honey, maple syrup, or nothing at all? How is it raw if it is heated? Seems like its cooked then. you start with raw milk and since it’s only heated to 140° you maintain the beneficial properties of the raw milk vs. the pasturized milk from the store. I look forward to trying it! I am a huge yogurt fan. There is nothing like the sweet taste of fresh homemade yogurt!